The shrine is situated in the forest park across the Prince Father and Princess Mother Memorial Garden.It houses a sculpture of Lord Virulhaka Maharaja Buddha Pandit, who was highly revered by the land donors and benefactors of the monastery construction as the benevolent force behind the success of the project. The Devalai or shrine and the park are dedicated as his abode where visitors and participants in Dharma practice can come to pay their homage and present offerings. Designed by M.R. 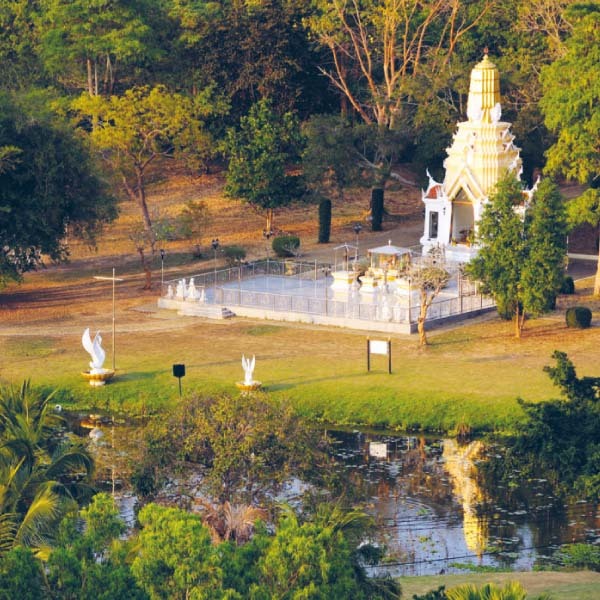 Mitrarun Kasemsri, the Shrine is surrounded by lush gardens that stretch from the Park to the pond’s edge. The name ‘Jaturangsee Forest Park’ means the park where the four haloed keepers of the world or Jatulokaban and their entourages reside. Lord Virulhaka Maharaja is one of the Jatu Maha Rachika, divine keepers of the four cardinal points, which comprise Thao Kuvera, generally known as Thao Vessuvan, keeper of the North and ruler of the Yaksas (giants); Thao Thatarot, keeper of the East and ruler of the Gandharvas, a type of heavenly beings; Lord Virulhaka Maharaja, keeper of the South and ruler of the Kumphan or giants; and Thao Viroopak, guardian of the West and ruler of the Nagas (great serpents).